Get rid of the Nervousness and Tension of Being out of your Comfort Zone! | JC Dance Co.
Joel and I just recently returned back from a trip to Tampa, Florida for the holidays. The weather wasn’t quite what we expected, as there seems to be quite a cold-front over the Eastern seaboard of the United States right now. 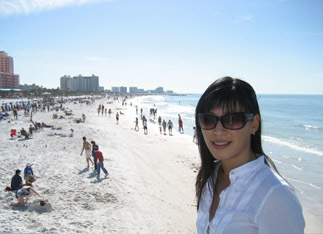 However, even though Florida is experiencing record low temperatures this winter, we still had a great time! We were lucky enough to get in a couple days of over 20 degree sunshine, and we even managed a stroll on the beach! Our main purpose of going to Florida was not for the sight-seeing and beach-hopping anyway; it was actually to spend New Year’s with our coaches and friends, Luca & Loraine. We had a fun and intimate New Year’s party with some Luca and Loraine’s closest students, family and friends. What better way to ring in the New Year than with great food, great company and loads of laughter! Most of the International students who were visiting Luca & Loraine were competitors preparing for the upcoming UK Open Championships, to be held next week (January 19-21). 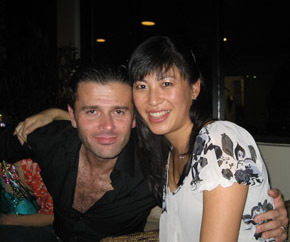 Luca & Loraine were actually still on holidays, having just come back from a long Asia tour, but they still opened the studio for the students to practice and continue their training. One morning, we decided to join the couples for a quiet morning practice. It was a small group of us, consisting of International couples from Japan, Slovenia, and of course, us from Canada! In a way, it felt like the good old days when we lived in Italy and trained with top competitors from all over the world. But then again, in another way… it felt very different…. Often, we get asked by our students if we get nervous before performing in front of large audiences, and our answer is always, “No, not really.” After having performed in numerous shows and competitions all over the world, we have gained the experience and thus the confidence to keep the nerves away. For the most part, because of this experience and confidence, we are able to dance freely, without tension and nervousness. Interestingly enough however, during this morning practice in Florida, amongst old friends and competitors, Joel admitted to me afterwards, that he felt quite nervous and stiff. Everyone was minding their own dancing, and there was nobody in the studio watching the practice, yet we felt out of our comfort zone. It has been a long time since we have practiced amongst dancers of this calibre and at the intensity of preparing for an International event, and therefore, we couldn’t dance as freely as we usually would. Honestly, we probably felt just like how many inexperienced dancers feel when then step onto the competition floor. Because the environment was so foreign to us, the nerves crept in, and the body just wouldn’t respond the way it usually does. Sounds a bit like a Newcomer on the dance floor for the first time, doesn’t it? Well, it can happen to anyone who is out of our comfort zone… even Professional dancers like us! Back when we were living in England and Italy, we would practice on a daily basis with numerous World-class International couples. We would practice and even occasionally do solo routines in front of top Pros like Jonathan Crossley, Lynn Mariner, Gianpiero Giannico, Anastasia Muryaeva and Erminio Stefano when they came for lessons in Italy with Luca & Loraine. We would also practice with the likes of William Pino, Jonathan Wilkins, Benedetto Ferruggia, Marat Gimaev, and Andrea Ghigiarelli in tiny London studios, bashing and bouncing off each other without a single worry. Needless to say, with all this experience training at the highest intensity, being constantly surrounded by the best in the world, our nervous tension eventually disappeared. Through this episode of practice in Florida, we heard our own words reverberating in our heads; instead of being directed towards our students, this time to ourselves. If you don’t have the experience of doing something on a regular basis, at the intensity that you expect to perform at, your confidence will not be strong enough to keep you at ease and to enable you to dance at your best. Inevitably, nervousness and tension will come into the mix and your performance will surely be diminished. Many dancers think that taking lessons and practicing is enough to get them ready for competition. But in reality, those are only 2 out of the 3 major ingredients for becoming a successful, experienced competitor. The competition environment is crucial. It is completely different from the lesson and practice environment, as it is at a much higher intensity and it puts you under a lot more pressure. Everyone gets nervous and stiff when they aren’t used to doing something on a regular basis… even seasoned Professionals like yours truly! So get yourself out there, join as many competitions, shows and demonstrations as you can! 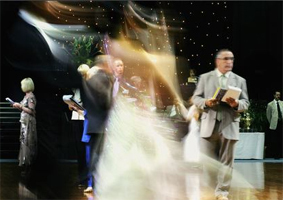 The more experience you have getting dressed up and dancing in front of an audience, the better. Throw caution to the wind and join the upcoming Snowball Classic, which will be held at the Hyatt on January 22-24. We just received word as well about the Chinese New Year Showcase at the Grand Ballroom, which is open to Pro-Am and Amateurs alike, to be held on February 20th. And of course, there’s the UBC Gala Ball on 12-13. In addition to competitions and demos, look into the competitor classes held around town. This will also give you the valuable experience that you need. JC Dance Co. holds it’s own PEAK competitor training sessions every Wednesday night at the Peretz Centre. So come join us and get rid of the nervousness and tension that comes with being unprepared!